I did this walk on Sunday 11th July 2010. Despite being one of our group walks due to other commitments only three of the group were able to do this stage, starting off from One Tree Hill where we had finished the previous stage the week before. After four stages I am now the only one who has been able to walk everyone, lets hope that lasts for the second half of the walk! 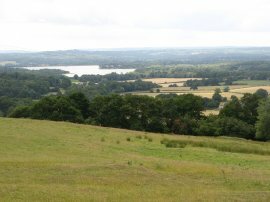 From our parking place at the top of One Tree Hill it was just a short walk down the path from the car park to rejoin the Greensand Way which we followed for a short distance down to the road at Carter Hill. We had a slight wait while Anne went back to the car to get something then we headed down the road for a short distance before joining a footpath on the other side. 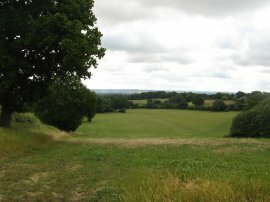 The path ran along the edge of some trees, close to the top of the ridge from where there were occasional views to the left over the Weald of Kent. 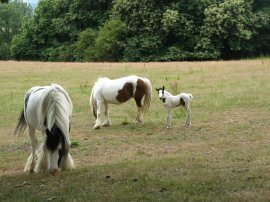 In one of the fields besides the path on the left was a very attractive new born foal, photo 2. 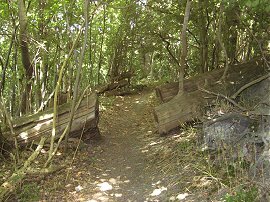 The route reaches a small lane before heading across an open patch of ground and through an area of trees to reach a Julians Street. 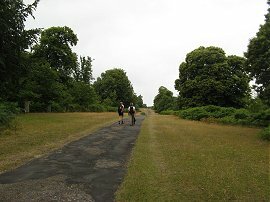 The Greensand Way then heads across the road and enters the grounds of Knole Park, soon turning to the left to head along Chestnut Walk, photo 3. The day had started quite grey, which was somewhat of a surprise after all the recent sunny weather and as we were walking through Knole Park there was a spell of drizzle which was almost heavy enough to consider putting on waterproofs although fortunately this soon passed over. At the end of the Chestnut Walk the route bends round to the left and leaves Knole Park to rejoin Julians Road before turning to the left along the A225 at Riverhill. The route heads downhill along the road for a few hundred yards before taking a footpath that runs to the right through a patch of woodland. There was a cyclist lying on the ground at the start of the footpath and at first it was unclear if he was hurt or just resting, it did seem quite early in the day to be lying flat out! The route once again heads alongside the hill with trees to the left before turning to the left and taking a path that runs downhill along a field edge path to reach the A21 Sevenoaks bypass. There was a rather obstructed gap in the hedge between two fields and I got a small rip in my walking trousers from a low piece of barbed wire as I went through which was rather annoying. 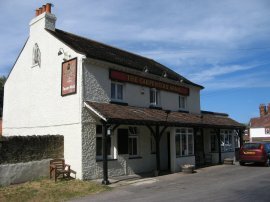 The footpath takes a broad tunnel under the road and then heads to the right along a track, passing some buildings where a shooting event was taking place before heading diagonally to the left a across a field to join a road on the outskirts of Sevenoaks Weald, close to the church. The route heads up the road to the right for a short distance before joining a footpath on the left that runs over a series of undulating fields, photo 4. This stretch of path passes a couple of farms and the buildings of Wickhurst Manor before eventually reaching the road at Bayley's Hill. 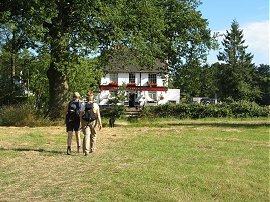 After a short stretch of road walking the route joins another footpath on the right as the Greensand Way starts heading steadily uphill to eventually regain the top of the Greensand Ridge by Goathurst Common. As we ascended views opened up and Bough Beech reservoir came into view in the valley below. By this stage the weather was starting to brighten up with the sun starting to come through the clouds. Reaching the top of the hill the route heads through another section of trees, photo 6, at Brockhill Woods where there were still the remains of a large number of trees that had been blown down in the 1987 storm. The route crosses Nightingale Lane and passes through a small car park before continuing through the trees of Stubbs Wood before heading briefly left then bending round to the right to join a track that leads up to Ide Hill Road where there was another car park and also some fairly decent public toilets where we stopped to give Zuka a refreshing wash down. The path then heads through the trees alongside Ide Hill Road before heading to the right to reach Ide Hill village, photo 7, where we stopped for and ice cream of the village green. The Greensand Way heads for a very short distance down Sundridge Road before taking a footpath on the left that runs between houses before entering another section where the route runs across gently rolling fields interspersed with the occasional small wooded area, photo 8. 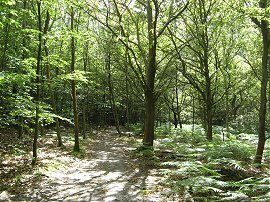 The path generally drops down from Ide Hill before climbing back up to the top of the Greensand Ridge in Scords Wood, photo 9. Passing through Scords Wood the route reaches Toy's Hill, crossing the road at another car park, again useful for anyone walking the route in different stages. The path winds its way through Toy's Hill, turning to the right to join a lane that runs more or less due north towards French Street. With the brighter weather and lack of streams of ponds to paddle in Zuka seemed to be feeling the heat and was definitely not running around like her usual self for a while. However Anne had plenty of water to give her a cooling wash or two, photo 10, and Zuka was completely back to normal by the end of the walk. Leaving French Street there was a long stretch of path that was mainly through trees. For someone who does not get to walk through woodland that often it made a very pleasant change with the sunlight shining down through the summer leaves. However the trees did rather cut down on any views and for an hour and a half I hardly took any photos instead of my usual one every few minutes! The route crosses over Hosey Common Lane before heading a small patch of open ground that leads to Mapleton Road. It then continues on over Mariners Hill to cross Hosey Common Road and enter the trees of Crookhamhill Common which is where I think photo 11 was taken along with the photo 12 of the chairs. 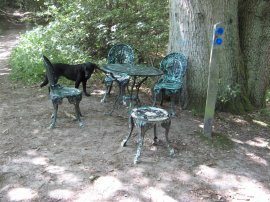 We had also walked past the chairs when doing our pre Christmas meal walk in 2008 although I hadn't been paying enough attention to the route that day to be able to write up the walk! 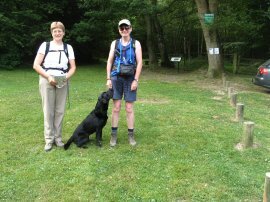 A little earlier in the walk we had met a couple who were heading to Westerham and were a bit lost and we bumped into them again just over Hosey Common Road where Sara kindly gave them the photo copy of the map we had for them to follow the path back to Westerham. Heading through Crookhamhill Common towards Goodley Stock the route was a little unclear and we missed the turn off that leads down to Goodley Stock Road although we soon realised this and only had to retrace our steps a short distance to regain the correct path. Crossing the road the route heads between some large houses before entering another patch of woodland, crossing over the border between Kent and Surrey at the same time where the spot was marked by a small plaque, photo 13. The path wound its way through the trees towards Limpsfield Chart where the Greensand Way crossed over the route of the Vanguard Way at the point where we had finished stage one of our walk along that path back in October 2009. Heading down Tally Road we stopped at the Carpenters Arms, photo 14, for a quick drink before continuing on to the B269 Kent Hatch Road. Here the Greensand Way heads to the right for a short distance before taking a footpath that heads diagonally off to the left, passed the buildings of Trenchleys Park. 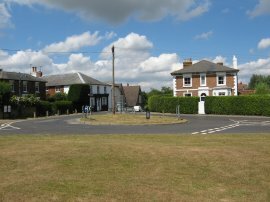 The route then turns right down Pastens Road, passing a number of large houses before taking a narrow fence lined footpath on the right that heads up to Chapel Road to reach Limpsfield Common. Here the route crosses over the road and heads on to Kiln Lane before crossing over the common towards New Road. 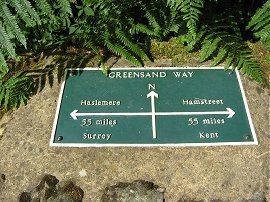 In a couple of places the route was a little unclear including one Greensand Way marker on the common that was pointing in completely the wrong direction. 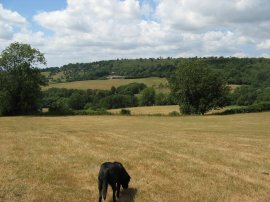 However with the map, and a bit of common sense, we were able to navigate our way over the common to Wolfs Row where the route heads to the left along a broad track the leads to West Heath and on to the outskirts of Oxted. The route continues ahead over Rockfield Road along Icehouse Wood before taking a long stretch of narrow footpath that runs between back gardens to Woodhurst Lane. Here the route continues ahead Spring Lane, heading downhill to cross over the River Eden. By the river was an old mill and a small pond where Zuka at last had the opportunity for a swim. 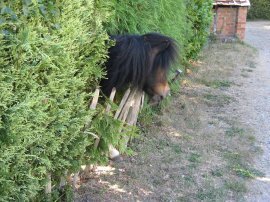 The route heads to the left along a track that runs besides the mill where we were surprised by a small shetland pony that stuck its head through the hedge besides the path, photo 15. The track soon ends from where it was just a short walk over a couple of fields to reach the Haycutter Pub on Tanhouse Road where we had parked the cars at the start of the day. The GPS made this walk 16.4 miles long, all of which had been along the Greensand way. 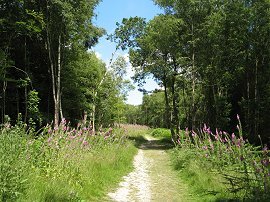 I have uploaded the route of the walk which can be accessed here Greensand Way 4 Route.